We want to make sure you aware of these two significant opportunities to connect with extended Jodo Shinshu sangha. One is the Honpa Hongwanji Mission of Hawaii’s first Joint Conference at the Ala Moana hotel in Honolulu from September 1 – 3, 2018. The conference will include the Lay Convention, the BWA Convention, the Minister’s Spouses’ organization, Jr. YBA, and Dharma School. Groups will hold their major conferences, and workshops will be open to everyone. The theme of the conference is “Embrace Change – Harmony (Accept Differences)” and our keynote speaker will be Hawaii Attorney General Doug Chin, a national leader in the fight for civil rights. For more information, including registration details, please see our Joint Conference event page. 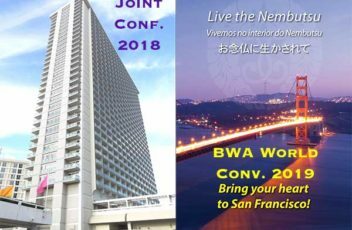 The 2019 World Federation Jodo Shinshu Hongwaji-ha Buddhist Women’s Associations Convention will take place Labor Day weekend, 2019 (August 30 – September 1, 2019) at the San Francisco Marriott Marquis Hotel. 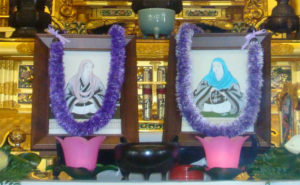 The theme is “Live the Nembutsu.” For more information, including an overview letter and a video, please see wbwconvention.org. We’ll also post more to our event page for the convention as the date gets closer.